How the Chief Minister is working with Singapore agencies to build a ‘smart, green, sustainable People’s Capital of Andhra Pradesh’. The capital has been planned on sustainable development principles, with extensive, open green spaces, to add value to the urban ecosystem. Uddandarayunipalem — UP Palem in short — where Prime Minister Narendra Modi will lay the foundation stone for the nation’s newest capital city on Thursday, is, according to Andhra Pradesh Minister Dr P Raghunatha Reddy, “vaastu compliant, with positive vibes”. In fact, the entire area covering 30 villages between Vijayawada and Guntur, some 35 km away from Amaravati town, was chosen to build the capital region of Andhra Pradesh due to its unique location. For, this is the only place where the Krishna flows north instead of east or south — considered an extremely auspicious occurrence. “The availability of contiguous terrain, and the willingness of a majority of farmers to give up their land, were the two other major reasons why this region was chosen. Also, the capital region is close to Vijayawada and Guntur, two developed cities,” an official said. Once the location was finalised, Chief Minister Chandrababu Naidu unveiled his vision of a grand capital that would, he said, match the world’s great cities in aesthetics, infrastructure, liveability, connectivity, and as the seat of e-governance and administration. 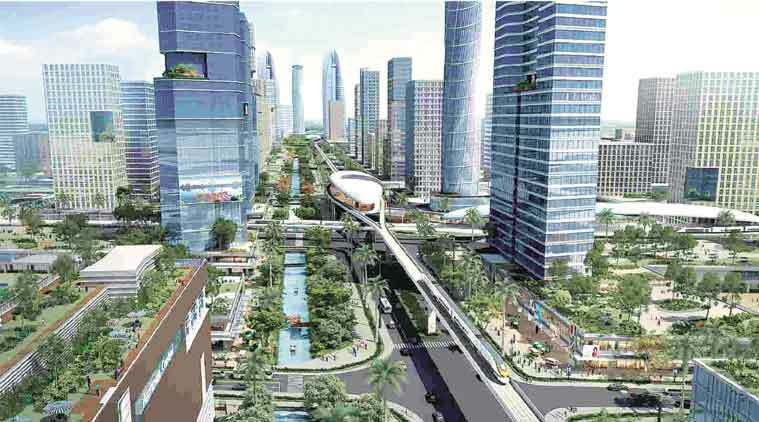 “Amaravati is envisaged to be developed as smart, green and sustainable city. In line with being developed as the People’s Capital of Andhra Pradesh, our aspiration is to create a vibrant, diverse, inclusive and modern city, which will be a symbol of pride for the people of Andhra Pradesh and India,” Naidu said. Last December, the state government signed an MoU with Singapore government agencies — Centre for Liveable Cities (CLC), Singapore Cooperation Enterprise, and Surbana — to prepare the master plan for Amaravati, which was submitted on July 20 this year. Construction of the seed capital development area — covering 16.7 sq km and comprising the AP Legislative Assembly, Legislative Council, High Court, Secretariat, Raj Bhavan, quarters for the ministers and officials, and the township for government officials — will start immediately after the laying of the foundation stone on Thursday. The Core City This phase of construction, for which the Centre has allocated Rs 1,500 crore, is expected to be completed by 2018-19. The key highlights of the Seed Capital Area (SCA) Master Plan of the Capital City are: * The SCA will be home to about 3 lakh residents. Being developed as a vibrant business hub, about 7 lakh jobs are expected to be created in various sectors, including in the government. * There will be a thriving, state of the art, Central Business District (CBD) for business and living. * The SCA master plan provides nodes and corridors as part of a transit-oriented development approach. To enhance citizens’ mobility and accessibility, there will be an integrated network of Metro railway (12 km), Bus Rapid Transit (15 km), downtown roads (7 km), arterial and sub-arterial roads (about 26 km) and collector roads (about 53 km). * The various zones will be: the CBD, residential townships, institutions, parks and gardens, water bodies, recreational spaces, waterfront etc. * The city will be planned on sustainable development principles, with extensive, open green spaces, to add value to the urban ecosystem. The landscape would have a world-class aesthetic appeal. * Special emphasis has been laid on pedestrianisation — with the development of 25 km of walkways linked to open green spaces to promote a walk-to-work environment and use of non-motorised transport. * The SCA master plan provides for waste management systems using innovative methods of waste collection, transportation, treatment and resource recovery. * The SCA will have more than 40% green areas and over 50% blue areas. * The SCA development will be implemented on a Public Private Partnership model by selecting a Job Creation and Investment Partner. From Singapore The three-part Amaravati master plan was developed by Singapore’s Surbana Jurong Private Limited. It also drew on Singapore’s expertise and experience in urban planning and governance, and project execution. The Centre for Liveable Cities and Singapore Cooperation Enterprise have begun to provide capacity development training in various areas to Andhra Pradesh government officials who will be involved in the development of Amaravati and the Capital Region. Simultaneously, work will start on the Capital Region Plan, covering 7,325 sq km. The master plan identifies the long-term economic positioning of existing towns and cities within the capital region and the context, therefore, for the growth and development of the future Andhra Pradesh capital city. It includes a regional socio-economic analysis and demographic study, and recommends a set of strategies to enhance connectivity to neighbouring cities and towns, while protecting agricultural zones and heritage areas, according to Singapore officials. Interconnected The capital area will have two ring roads — a Regional Expressway and an Outer Regional Expressway — and several radial roads, including a Capital City Bypass and a Vijayawada Bypass connecting various towns to the core capital region. Industrial zones would be established at Sattenapalle, Nandigama, Gannavaram, Nuzvid, Kondapalli, Tenali, Pamarru, and at two locations in the capital city. A dedicated freight corridor would be created within the state to connect with highways leading to New Delhi via Hyderabad. There will be connecting roads and development corridors — on NH 5 towards Vizag on one side, and Chennai on the other; NH 9 towards Hyderabad; NH 221 towards Raipur; NH 214A towards Kakinada on one side and Chennai on the other, and towards Kurnool and Bengaluru. National Waterway 4 has been proposed to be developed on two routes — Wazirabad-Vijayawada-Vodarevu Port and Wazirabad-Vijayawada-Rajahmundry-Kakinada — connecting other places via rivulets and canals. An airport is planned at Mangalagiri, and five corridors will have high-speed railways. Adequate green spaces have been earmarked in the plan on all sides of the city.